I was skeptical—as Cassatt did not produce many studies—but I did a quick Google search to see if I could verify the identity of the individual who had written. Bingo! I did indeed find his book, the study of a mid-nineteenth-century costumbrista (genre) painter from Seville who specialized in picturesque Andalusian subjects. I also wrote back and asked for images. It seemed like a long shot, but Cassatt had begun her career in Spain, spending six months in Seville during the winter of 1872 to 1873. 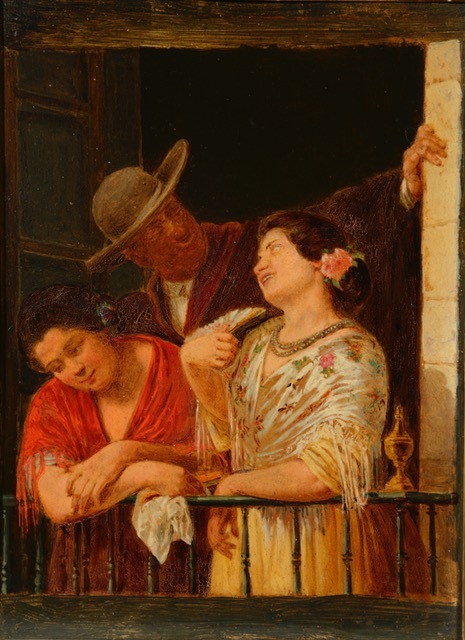 Her most well-known paintings from the trip are On the Balcony (fig. 1), Offering the Panal to the Bullfighter (1873; Clark Art Institute), and Toreador, also known as After the Bullfight (1873; Art Institute of Chicago). These are among Cassatt’s first mature paintings. 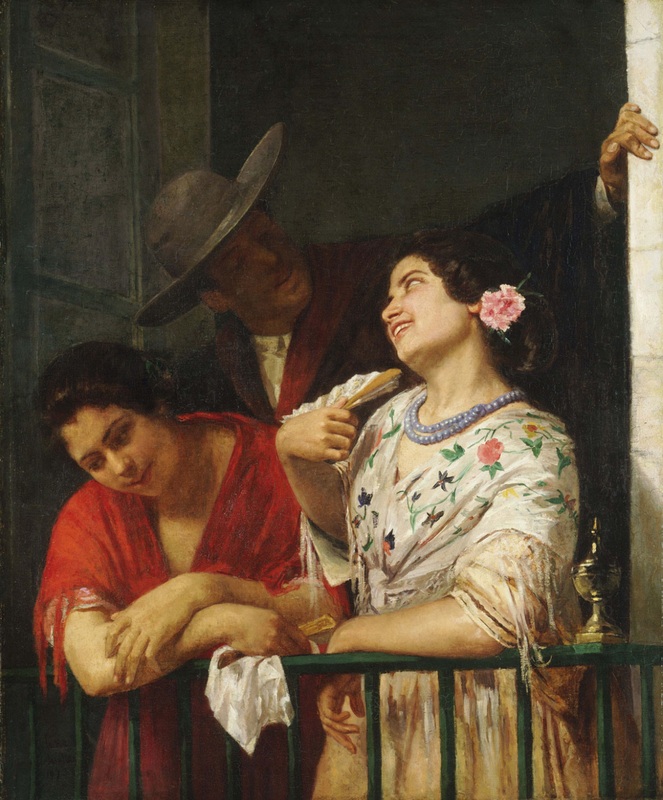 On the Balcony derives partly from her study of Bartolomé Esteban Murillo and Francisco Goya, and its early exhibition with the title The Flirtation: A Balcony in Seville makes its amorous content obvious.3 Offering the Panal—the panal is the honeycombed sweet being dipped into a glass of water held by a cocky young woman—is likewise anecdotal and romantic in theme. 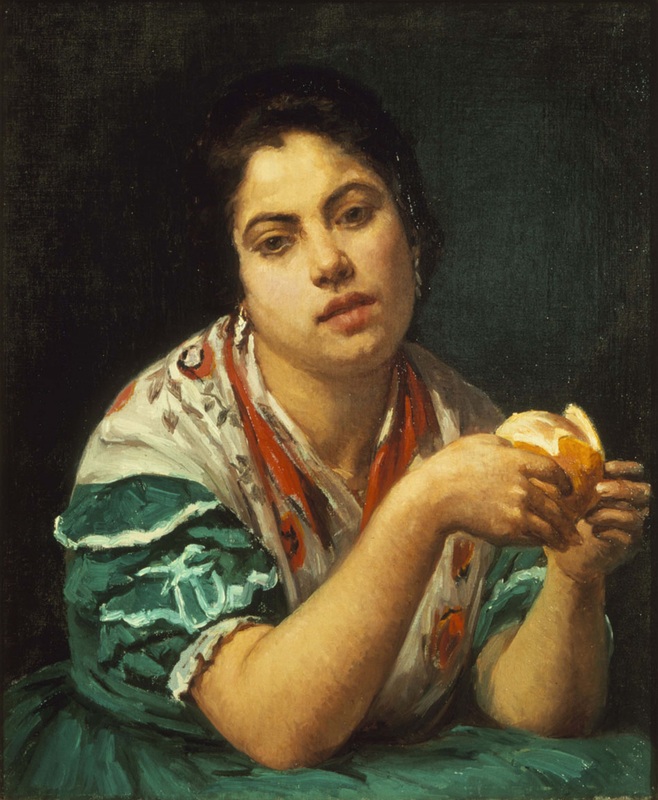 Cassatt also produced several single-figure images of women during her sojourn in Seville: Head of a Spanish Girl (1872; private collection), Spanish Girl Peeling an Orange (fig. 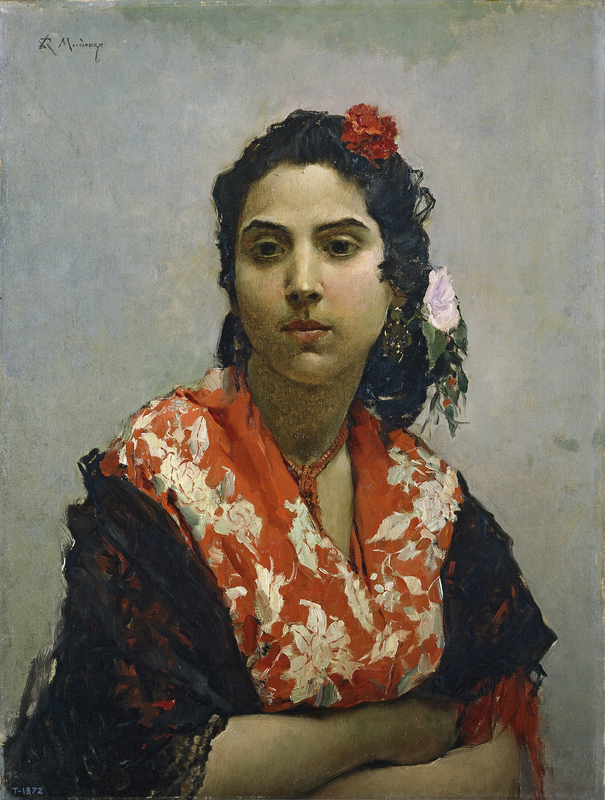 2), and the painting known today as Spanish Dancer Wearing a Lace Mantilla (fig. 3). All these paintings, with the exception of Head of a Spanish Girl, appear in the Adelyn Breeskin Cassatt catalogue raisonné.4 Throughout years of studying artists from the United States who traveled to Spain, I have often wondered how many of them left things behind. At the beginning of her career and without a ready market for her work, might Cassatt have been one of them? 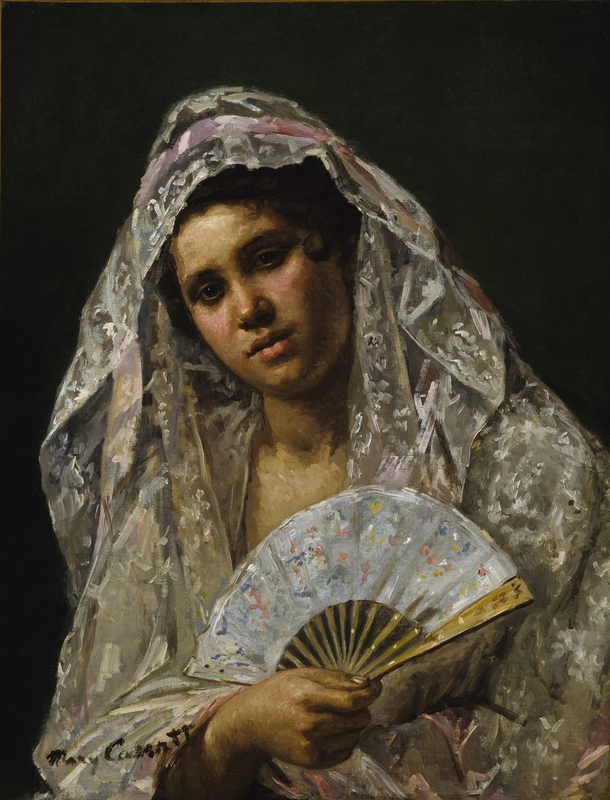 Cassatt traveled to Seville from Paris, stopping off in Madrid to visit the Museo del Prado. She arrived in the capital city on October 5 and made her way quickly to the famed museum. Three weeks later, after copying Diego Velázquez, Don Baltasar Carlos (c. 1635; Museo del Prado) and gaining renewed appreciation for the work of Murillo, Cassatt arrived in southern Spain. Whereas the landscape between Madrid and the south had been “immensely sad, vast, and dreary,” Seville was “full of color, gay lively, the Cathedral magnificent, orange trees growing in the streets and squares.” She awoke the day after her arrival, on Tuesday, October 26, to find “the sun shining brightly on this beautiful clean town, [and] a most delicious spring temperature.”5 Hoping to paint original works in the charming Andalusian town, she soon found a studio in the Casa de Pilatos, a sixteenth-century palace belonging to the ducal family of Medinaceli in the nineteenth century. Manuel Barrera Haedo (active 1849–1876) is indeed a marginal figure in the history of Spanish painting.9 Listed in the Madrid periodical El Clamor Público as exhibiting in the May 1849 Exposición de Bellas Artes in Seville, he appears again in Manuel Ossorio, Galería biográfica as having won a bronze medal in the Seville exhibition of 1858.10 He is also listed as a painter in the first edition of Manuel Gómez Zarzuela, Guía de Sevilla in 1865, along with more well-known compatriots Joaquín Domínguez Bécquer (1816–1879), Manuel Barrón y Carrillo (1814–1888), and Manuel Cabral y Aguado Bejarano (1827–1891), with whom his work is often confused.11 Like Domínguez Bécquer and Cabral Aguado Bejarano, Barrera specialized in costumbrista painting; art historians Enrique Valdivieso and José Fernández López included two of his paintings, correctly ascribed, in their recent book on painting in Seville.12 Danza en un interior (fig. 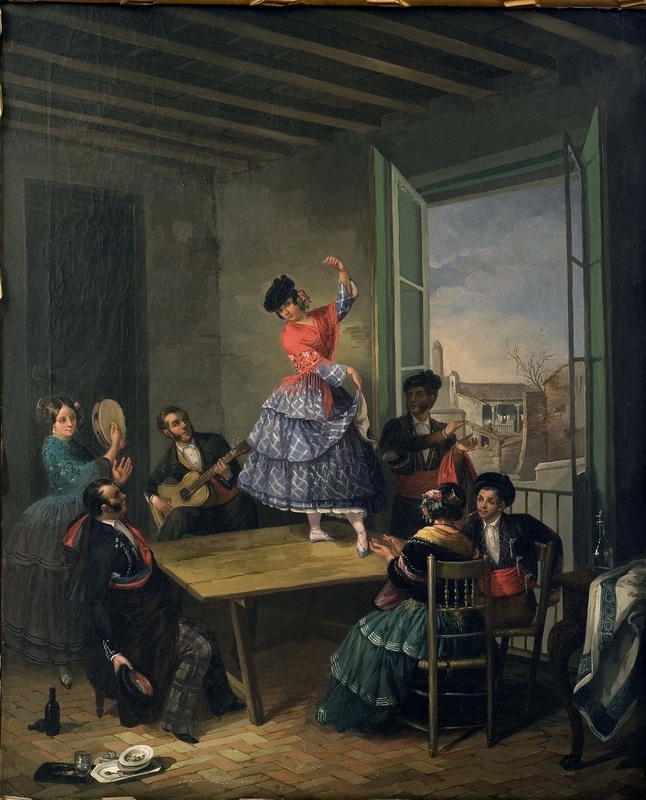 6) gained a certain degree of notoriety during its time, as it was professionally photographed by Charles Clifford and, on occasion, copied by others.13 The subject of a woman dancing atop a table, surrounded by guitar players and other accompanists, was frequently essayed by costumbrista painters in Seville. 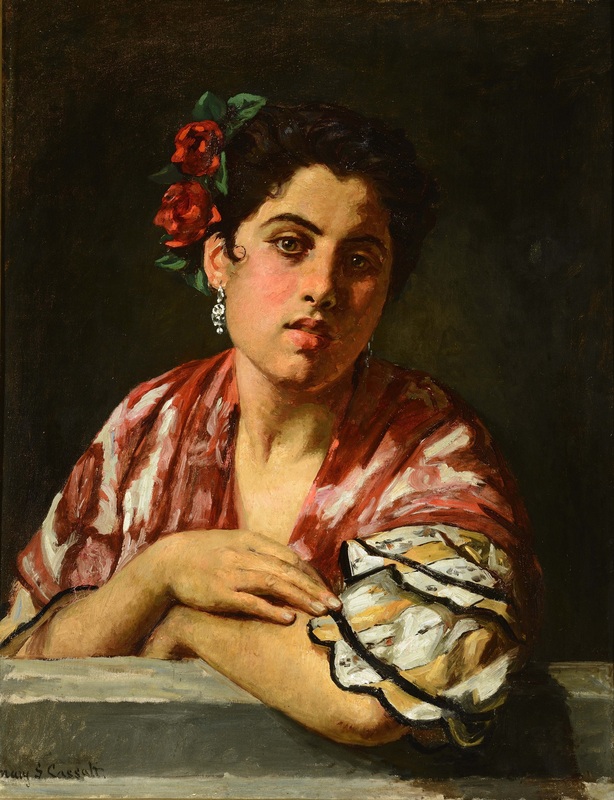 Madrazo’s Gypsy (fig. 7), which came to the Prado from the Errazu collection, makes a compelling comparison to this newly discovered painting by Cassatt; both have taken advantage of the “peculiar rich dark colouring of the models,” adorning their raven hair with red carnations, silver earrings, and a red and white mantilla. Cassatt, who probably painted Spanish Girl Leaning on a Window Sill early in her stay, before On the Balcony, has still not quite learned how to keep the black trim on her model’s dress from sitting on the surface of the canvas, yet the modeling of her sitter’s face, the shadows of the neck, and the tapered fingers resting on the forearm are executed with considerable finesse. The signature, “Mary S. Cassatt,” and the dimensions, not quite 25 x 20 inches, conform to other paintings created at this time. Whereas Barrera, an amateur painter a generation older than his young friend from Philadelphia, worked in a traditional costumbrista manner, Cassatt was moving toward the more naturalistic and cosmopolitan trends of Paris. Barrera wrote soon after her departure from Seville, offering her the studio again the following winter. “It is immense,” Cassatt told Sartain, with “two windows, so if you want to come, we can divide w/ curtains.”17 Sartain’s response is not recorded, and Cassatt ultimately decided to settle in Paris; she did not return to Spain until some thirty years later, in 1901, traveling as far as Madrid but not to Seville. The addition of these works to Cassatt’s oeuvre brings the nature of this innovative painter’s early artistic development into greater relief; it also demonstrates the extent to which artists from the United States were looking beyond their immediate surroundings in the early 1870s. Cassatt may have given these two paintings to Barrera in appreciation for his advice, or she may have simply forgotten them in the studio when packing for the next stage in her journey, leaving behind a memory of her visit with a friend in Seville. Cite this article: M. Elizabeth Boone, “The Paintings Left Behind: Two New Paintings by Mary Cassatt from Seville,” Panorama: Journal of the Association of Historians of American Art 4, no. 2 (Fall 2018), https://doi.org/10.24926/24716839.1666.